Thailand’s northernmost province is often overlooked by a lot of people that rather go visit its bigger neighbor Chiang Mai. And even though it might be true that it isn’t equally worthwhile to live in Chiang Rai there are many reasons why you should visit this province for more than just a a couple of days. 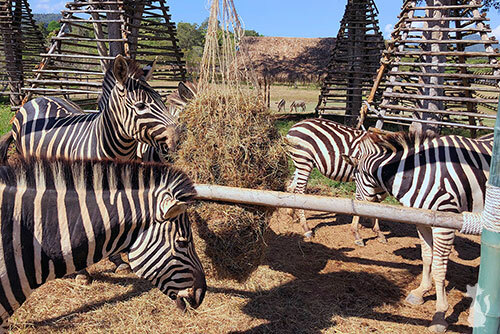 In fact there are even more of these quintessential must do’s and must visit attractions in Chiang Rai as compared to its bigger brother Chiang Mai that is more attractive for its everyday life. Best example you probably have heard about the Golden Triangle, one of Asia’s two big opium-producing areas (along with the Golden Crescent in Afghanistan), that covers the mountainous area of Thailand, Myanmar and Laos. Chiang Rai was founded in 1262 as part of the Lao-Thai Lanna Kingdom and it wasn’t until 1786 that it became a Siamese territory and eventually one of modern Thailand’s 77 provinces in 1910. Chiang Rai city has a population of just about 200,000 people so it’s small, relaxing and delightful yet big enough to provide several international restaurants and the modern Central Plaza shopping mall with all the famous foreign department stores, a western style supermarket and a cinema. Without doubt the most famous and most photographed sight in the Chiang Rai province, Wat Rong Khun is one of the most beautiful (and unconventional) temples in Thailand. Also known as the “White Temple” it represents the purity as well as the bizarre blend of traditional Thai architecture and the surreal. Designed by the local Chiang Rai artist Chalermchai Kositpipat in 1997, it took 15 years to open its doors to the visitors but may not be completed until 2070. Wat Rong Khun has countless of symbols derived from Buddhist and Hindu traditions as well as some more unorthodox features. Inside you can find not only the statues of the Buddha but also images of Superman, Batman, and Neo from The Matrix who the artist believes support the Buddha’s message. Chalermchai dedicated the temple to Lord Buddha and believes the project will give him immortal life. Wat Rong Khun is located 12 km south of Chiang Rai just off the highway (Pahonyothin Road). It’s open to the public daily from 6:30am to 6pm. 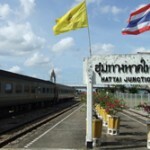 Foreigners pay 50 Baht entrance fee. 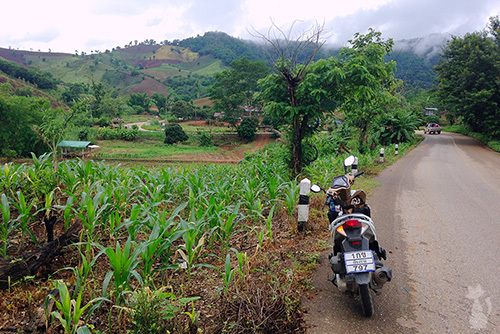 The mountainous northern part of Chiang Rai has several interesting villages that make a great full day or overnight trip. Probably the most picturesque and serene one is at Doi Mae Salong, 74 km northwest of Chiang Rai city. Visiting there almost gives you the feeling of being in a small village in southern China, most of the friendly locals do have their roots there and speak Chinese to each other. The one thing you do not want to miss out in Doi Mae Salong is the big stupa that sits enthroned over the village and has the nicest views of the mountainous areal you can imagine. 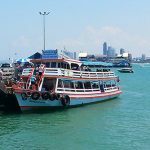 There are also numerous scenic treks along the tea and coffee plantations and that’s what makes this place worth visiting after all: It’s extremely laid back and relaxed, all the hustle and bustle of the capital Bangkok seems thousands of miles away. 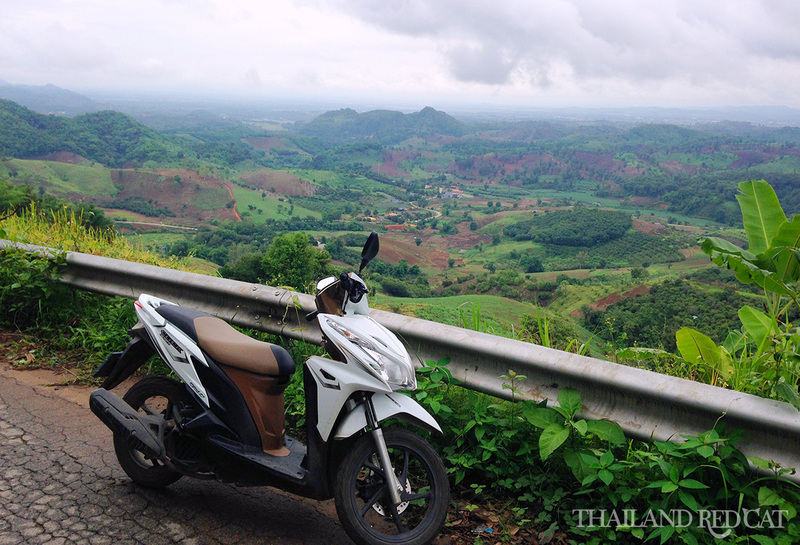 It’s not just nice to spend time at Doi Mae Salong but also the trip there from Chiang Rai is memorable, especially if you ride a motorcycle and especially the last 24 km when you get off the highway at Mae Chan and start cruising up and down the hills. 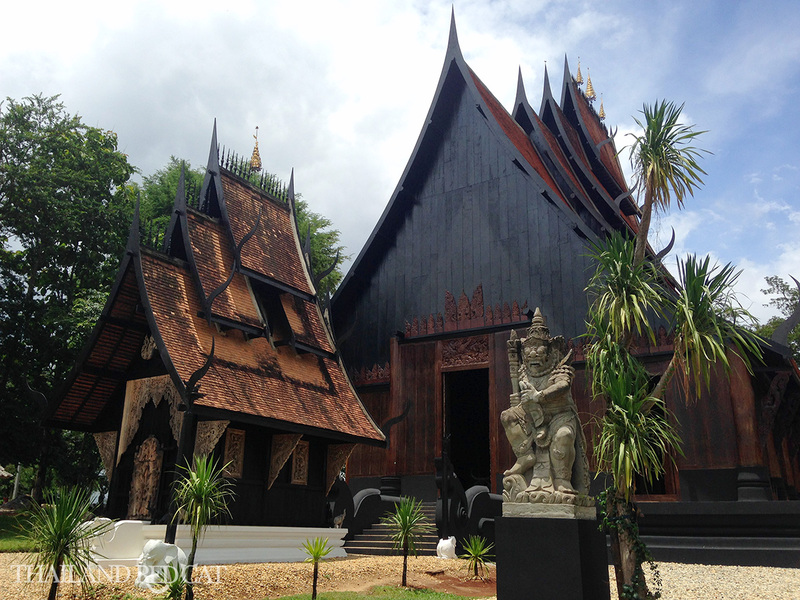 Just like the white temple south of town, the “Black House” (in Thai Baan Dam) is another highly ambitious project of another Chiang Rai born artist: Thawan Duchanee. It aims to illustrate the darkness in humanity. 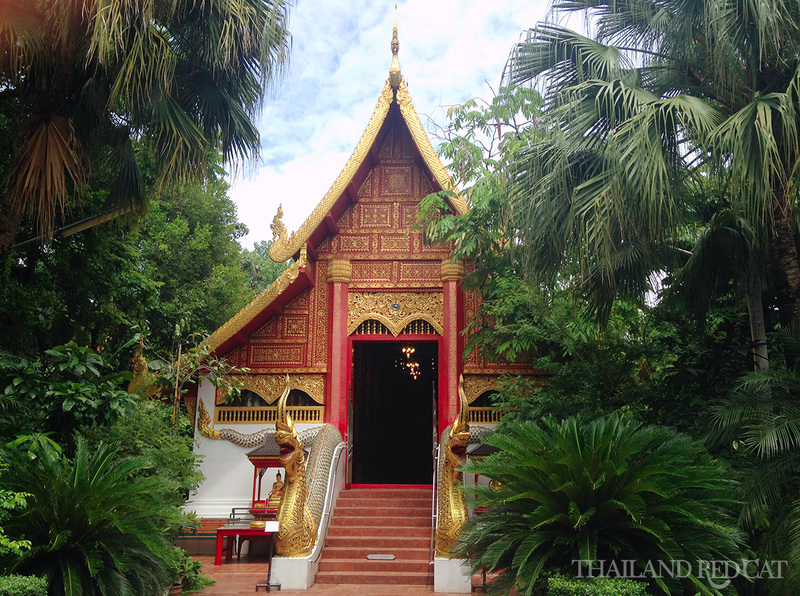 There are numerous red and black hues, skins, skulls and other animal parts made into artwork and exhibited in the huge wooden house (that almost looks like a Thai style temple). Baan Dam is located about 10 km north of Chiang Rai off the highway (Phahonyothin Road) leading to the Thai-Burmese border at Mae Sai. It is open daily from 9am until 5pm but closes for one hour at noon. There is a visitor center, souvenir shop as well as a small cafe located at the car park right opposite the Black House. Even though it doesn’t attract nearly as many visitors as Wat Rong Khun and Baan Dam, Wat Phra Kaew is the single most significant cultural and religious site in the Chiang Rai province. According to the legend, in 1434 the temple’s chedi was hit by lighting and damaged and after some of the stucco fell off the most highly revered Buddha image of Thailand was revealed: The Emerald Buddha. There are different theories about the origin of the Emerald Buddha. Most likely it was created in India some 2,000 years ago and brought to Sri Lanka, then to Cambodia and at the end of the 14th century to Northern Thailand where the King of Chiang Rai hided it in the chedi of Wat Phra Kaew. Today, the Emerald Buddha is kept in Wat Phra Kaew in Bangkok while a replica of the image can be found in the ubosot of Wat Phra Kaew Chiang Rai (picture). The clock tower traditionally marks the center of the province’s capital cities. That’s usually also where a lot of nightlife venues are clustered around and make popular hang out spots for street hookers. 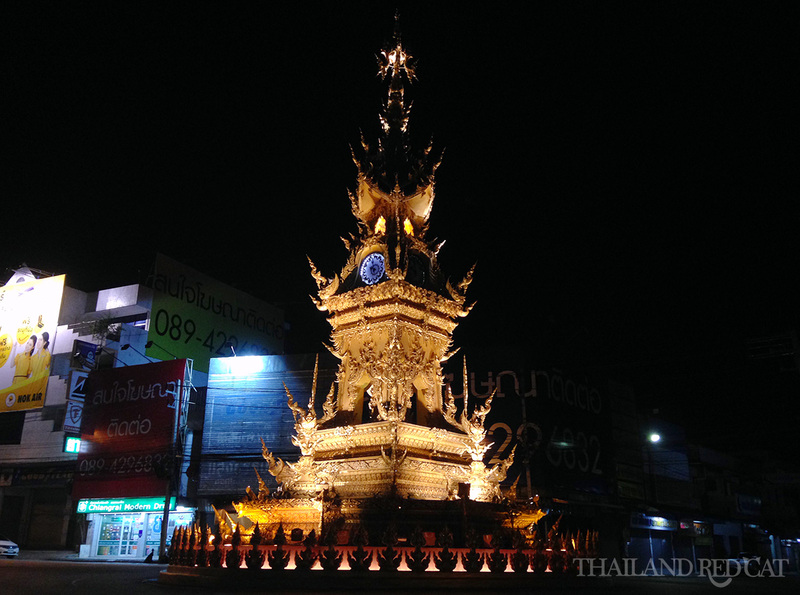 Just the same in Chiang Rai but it’s extra worth mentioning it here because this clock tower is one of the nicest and most impressive ones in Thailand. No, unfortunately this isn’t a beer brewery site, the Singha Beer Factory is still in Bangkok, but they are producing tea at the Chiang Rai Singha Park. 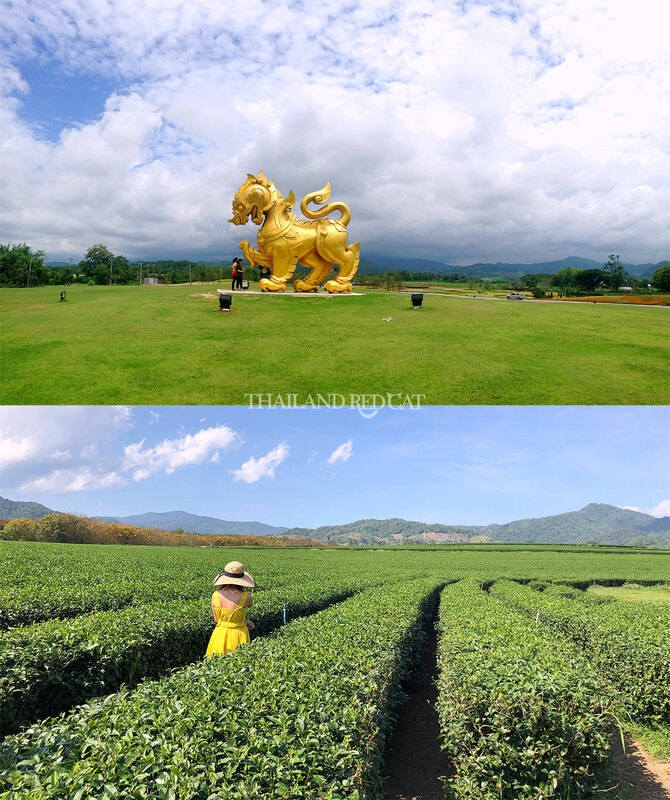 The main reason why most people like to come here is the massive golden Singha Lion Statue on top of a wide green field. Very picturesque and worth dropping by after visiting Wat Rong Khun (the White Temple) just a 10 minutes drive away. I highly recommend you to join their Farm Tour on the open air shuttle bus (100 Baht per person, leaves every 30 minutes), which takes you all around the huge areal. There are 7 different stops (Hop-On Hop-Off), and you’ll get to see a beautiful lake full of swans, scenic tea plantations, flower fields, animal sanctuaries and atmospheric restaurants serving (amongst others) cool Singha draft beer. Check out my video of that tour down below.